I wasn’t expecting Choice of Kung Fu ($3.99) to be my new favorite in the Choice of Games lineup. My first thought was “okay, a gamebook fighting game, well, why not." I expected plenty of fight scenes and lots of attacks named after animals. The opening scene of the game, a bandit attack, immediately delivers on both. What I wasn’t expecting was the depth of historical, mythological, and philosophical accuracy to the game. Before I lose any of you, let me assure you that you can play the game for the fights: there are plenty, and they are engaging. You can even play through the game as a brash and hot-headed fighter with no interest in enlightenment or mysticism. That said, what amazed me was seeing the Buddhist, Taoist and Confucian strains of thought, complete with their conflicts (but never categorical oppositions) that play out in the game, and seeing the opportunity to play according to those philosophies, or reject them all. Unlike the dry and dusty annals of Western Philosophy (I’m not expecting Choice of Kantian Imperatives any time soon), the Eastern Philosophies intertwine deeply with mythology, mystery, and of course the martial arts themselves. Author Alana Joli Abbott captures the feel of a mythic China of the Qing era, the China of its own myth, creating a setting in which fox spirits and Taoist Immortals coexist with gunpowder and simple hunger. The threat of the Mongols is at bay, but new foreigners, Europeans, are encroaching. This is not high fantasy: the game revolves largely around complex politics and the necessities of life. The bandits in the opening scene are desperate peasants, and you may decide to assist them, quash their rebellion, ignore the situation in favor of monastic contemplation, or navigate a middle way, as I was able to do on my first playthrough. You can play zen, be like water, treat the easy as hard and so encounter no obstacle, wei wu wei. As with Choice of Games’ other titles, there is considerable emphasis on shaping who your protagonist is, as well as overcoming challenges. In Choice of Kung Fu you pick your character’s attitude toward gender roles as well as her or his gender, and your first decisions about how to fight form a composite image of your fighting style. 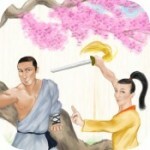 The styles are described knowledgeably, from real-world tiger and crane styles to chi-based “magic" that should please fans of Naruto and wuxia. Choice of Kung Fu has few flaws, but there are points were some of the game’s many decisions and options aren’t fully reflected later on. I can’t explain this without a marginal spoiler, so consider yourself warned. Having chosen in one game to make my protagonist a bisexual man, I then successfully pursued the affections of Feng, the shapeshifting Fox spirit. Though appearing at times as male and others as female, the game thereafter treated the spirit as basically female, occasionally appearing in male “guise," and made no nod whatsoever to my protagonist’s stated interest in “both men and women." More generally, there was some content late in the game where it should have mattered that Feng was my character’s romantic partner, but it wasn’t addressed. In neither case did the game do anything contradictory or wrong, it just could have done more. Something that isn’t exactly a flaw, but will displease some gamers, is that the difficulty curve is relatively shallow. I at least found it easy to navigate a path not only to success but to the kind of success I was looking to achieve. 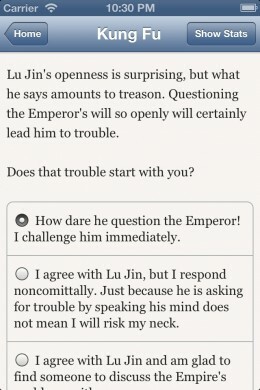 That might have had something to do with my aforementioned familiarity with the philosophies that undergird this game: it’s always difficult to filter for one’s own perspective, but replaying Choice of Kung Fu suggests to me that the author wrote it to be more about selecting a path than having to find the right option. At the same time, I discovered that several of the “obviously right" options I chose on my first playthrough disappeared when I changed how I played the game. That means that those options were only there because of how I developed my character, and that was satisfying. Similarly satisfying were the options with lasting consequences but no game-over possible, affecting the lives of others. 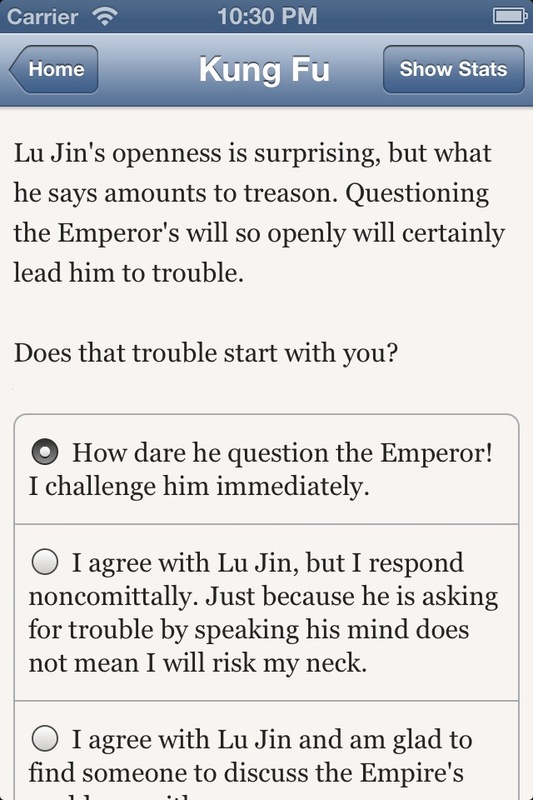 Right now, I’m playing as a take-no-nonsense female whose loyalty is to the common people first, the temple second, and the Emperor not at all. At some point, I will have to play through as a faithful Confucian, and another as someone willing to cut deals with the Europeans. Though neither of those paths appeal to me personally, I think it will be enlightening to see the (game) world that way.